Well, it was bound to happen. 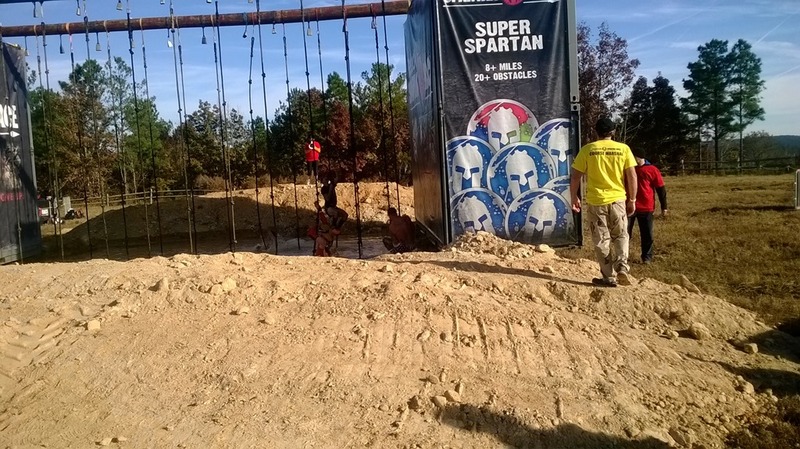 Someone finally talked me into doing one of the Spartan races. I kept it under wraps for the most part, because honestly, even though I was signed up, I wasn’t quite sure how it was going to work out with doing the XTERRA World Championships. 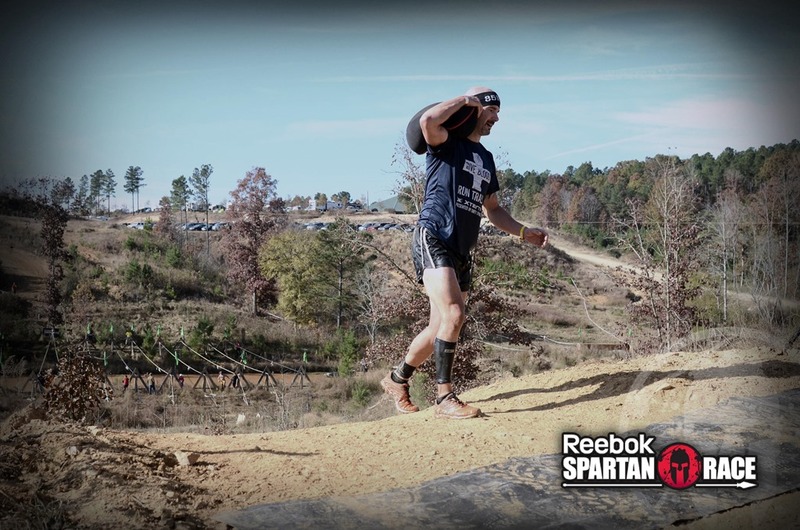 The race chosen was the Spartan Carolinas Beast on November 9th. Even though this was two weeks after Worlds, I had already planned on being in Maui for two weeks. Alba and I needed the getaway and I needed the downtime from training and racing. I purposefully didn’t do ANYTHING structured the week after Worlds and I knew that would be contradictory with going into a 13 mile trail run that also consisted of 20+ obstacles. 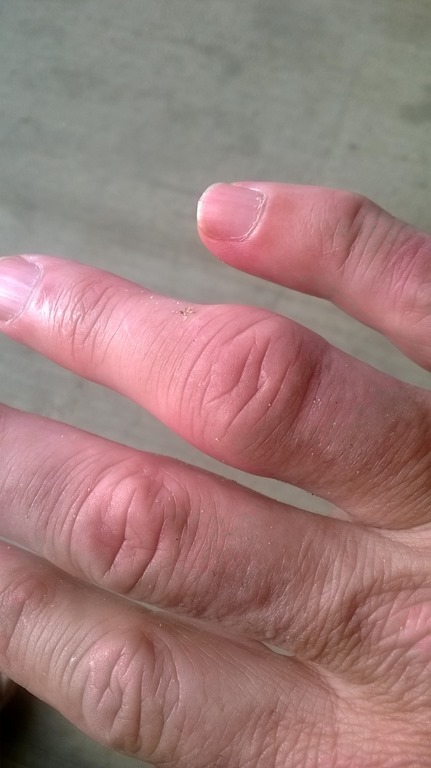 Adding insult to injury (pun intended) was my fat, thick, swollen, painful, yet-to-be healed ring finger that I dislocated after a short trip over the handlebars in Pisgah. 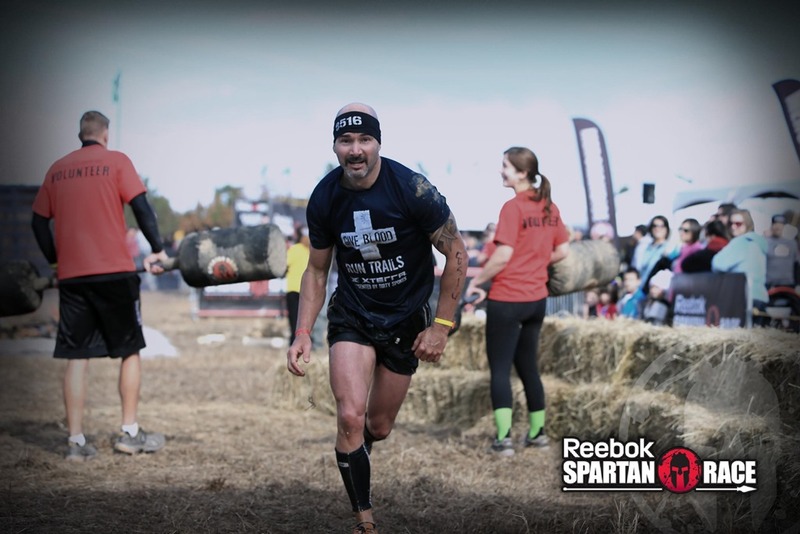 Here’s a pic of it about a week out from the Spartan. 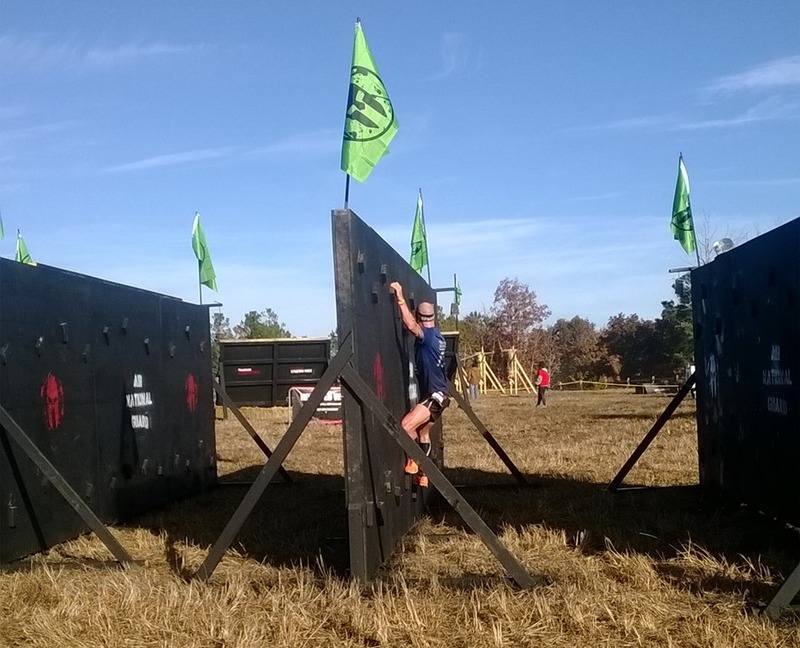 Although racing an XTERRA is doable with such an injury, doing an obstacle course that involves rope climbing, wall climbing, carrying 90 pound blocks of concrete and the like, is not so doable. Like most last minute decisions I have been known for, I didn’t make the final decision until the morning of the race. Matter of fact, Alba and I had to get up at 4:30 to be at the race in time and I waited until about half-way there to make the final decision. We debated it back and forth until finally we said “screw it” and decided to give it a shot. If halfway through the race, my hand started giving me problems, I’d throw in the towel and walk away, still gratified that I at least gave it a shot. 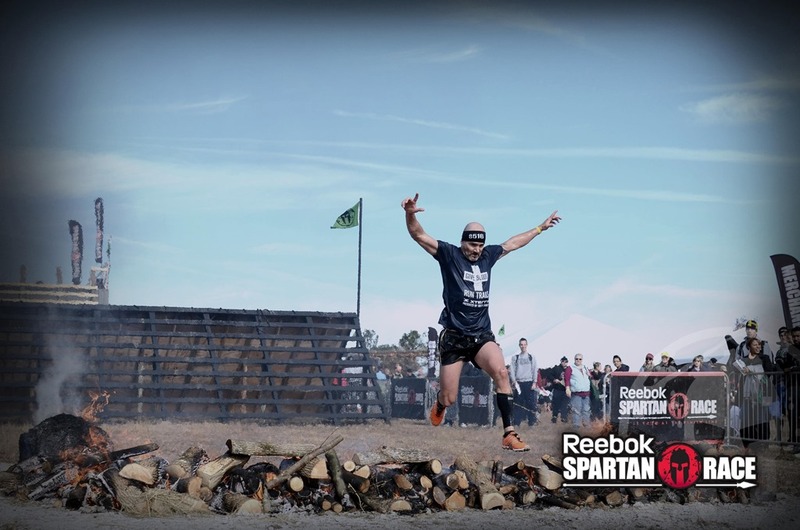 Fast forward to race start, I did a bit of warmup and dynamic stretching before jumping the 7 foot wall blocking the race start chute. After a quick handshake/impromptu introduction to Hunter McIntyre, the race started with what was described to me as typical Spartan fanfare. Here’s a video Alba took of the race start. I was surprised that we had obstacles right out of the gate. Three deep trenches of muddy, cold water. The air temp was a brisk 34 degrees Fahrenheit when we started and I am sure the water wasn’t much warmer. 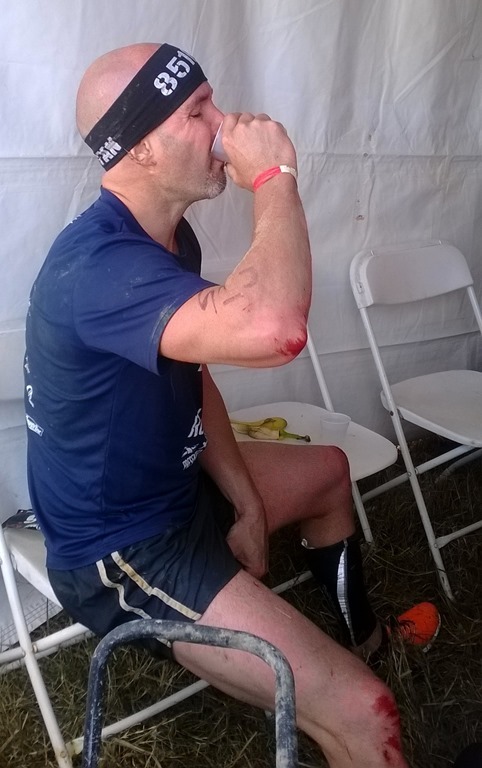 This was followed by over-under obstacles which I got through pretty quickly and I settled into 7th place overall. I could see Hunter up ahead in first setting a good pace and I seemedto be maintaining the same distance between us. A couple of friends warned me going into the race that making it through the obstacles cleanly would make all the difference when it came to race placement, so I tried to do just that. 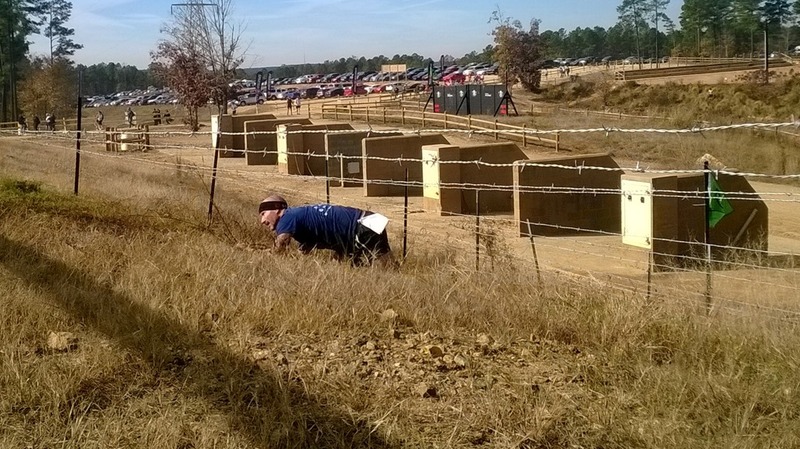 The race organizers ran us up and down dirt bike and four-wheeler trails and then through the woods. Many times we were only following tape hanging from the trees with no trail whatsoever. We were creating the trails for the racers behind us. This meant trudging through rough bush, briars, down ravines on your arse and a few hand-over-hand climbs. It wasn’t long before I lost all feeling in my hands from the cold. I had opted out of wearing gloves because I knew getting them wet would only cause problems at the obstacles, especially the monkey bars. I kept working my fingers making fists to try and keep the blood flowing so that I could at least use my hands if needed. 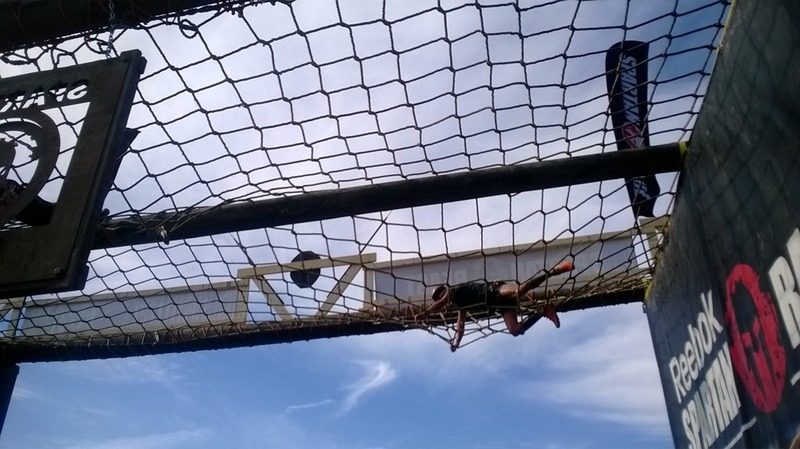 Reaching the first rope obstacle, one where we have to pull a rope to raise a concrete block up a pulley, I could use my hands, but I couldn’t feel a thing. It was here that I realized that my injured finger meant I would have to rely on my left arm to do the bulk of any pulling work. 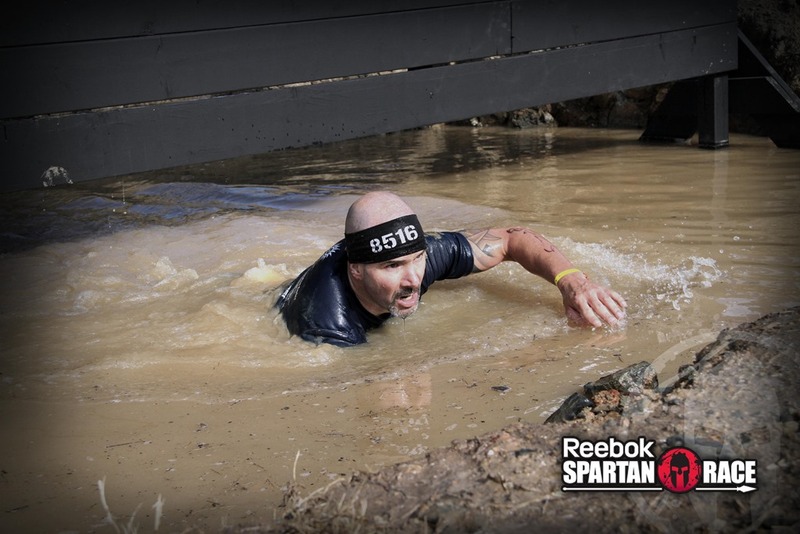 I made it through the obstacle and kept on trucking. 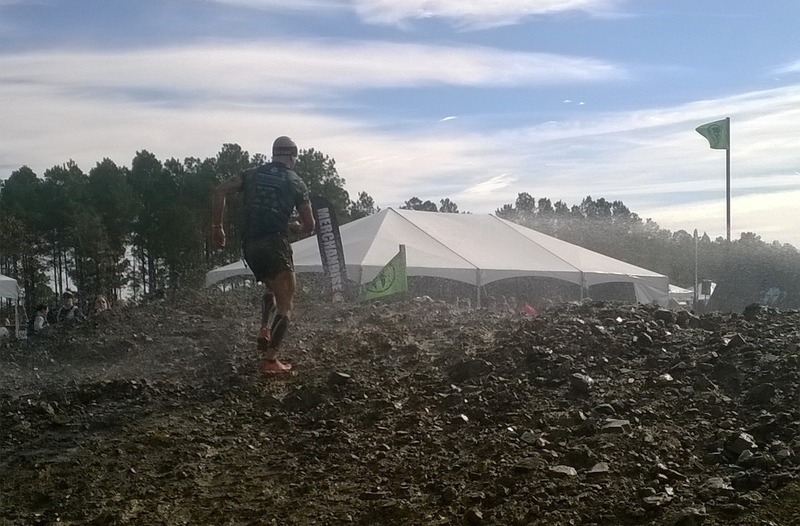 The course worked in my favor as it had TONS of hill climbing. 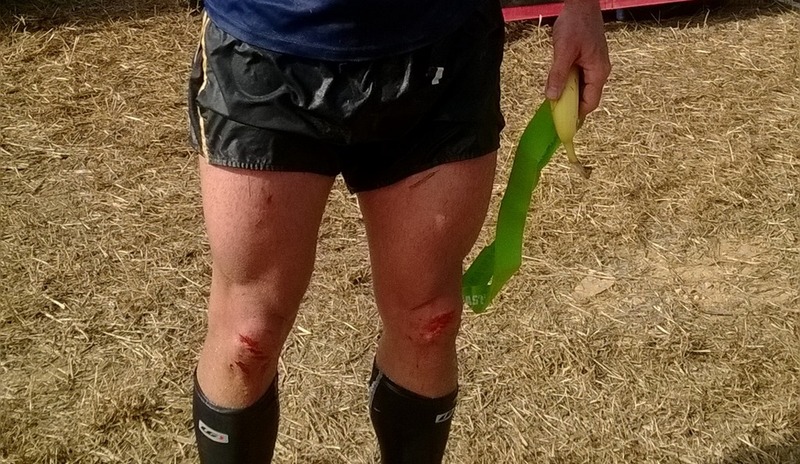 Having performed lots of climbing in prep of XTERRA Worlds, I was prepared for the running at least. 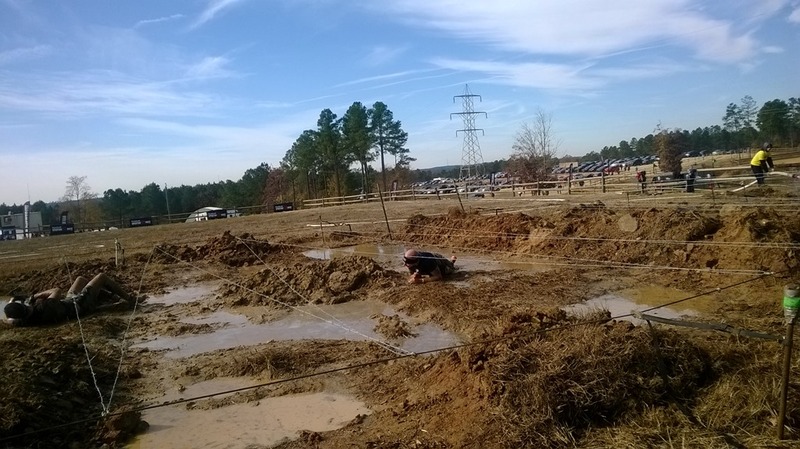 By the time we made it back to the spectator area, I was square in 5th place overall. I cleared all of the obstacles (transverse wall, inverted wall, rope climb) cleanly and quickly with the exception of the spear throw. Let’s just say that I didn’t realize how much of a stabilizer your ring finger is when throwing something. My spear went hard left of the target. Shameful. So were the 30 burpees I had to do allowing lots of folks to pass me. Spear throw. Yes, that’s my spear doing a left-hand turn. 50 pound sandbag carry. Rope traverse water crossing in the background. 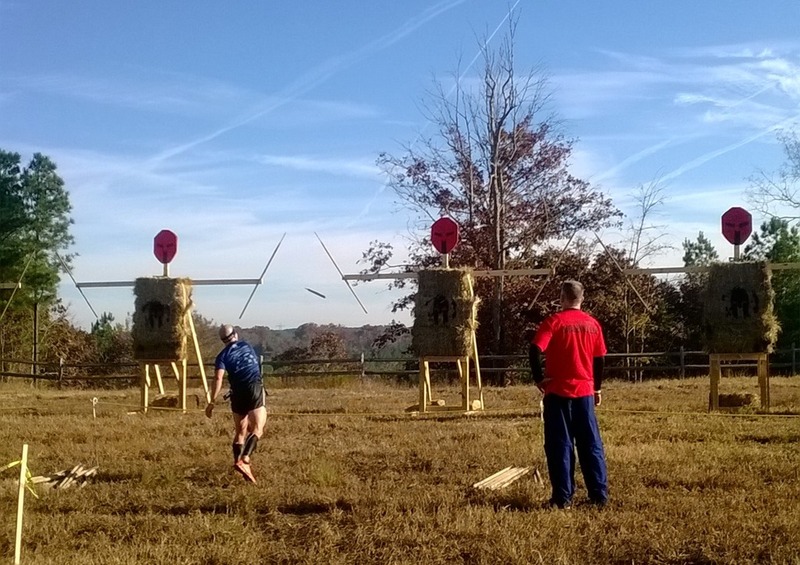 I continued on the rest of the course knocking out all of the obstacles with the exception of one where I had to run across upright logs. 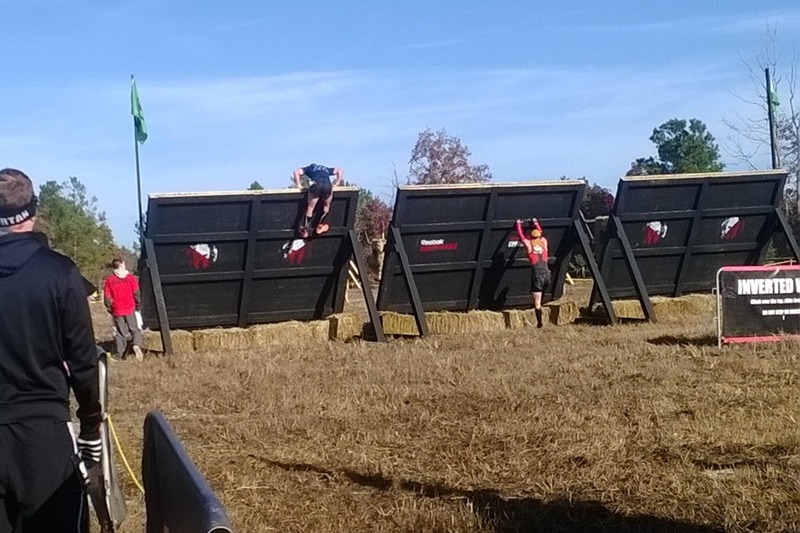 Not sure what you call the obstacle, but needless to say, 30 more burpees and many more folks passing me was in order. Alba took more good pics of me doing the barbed wire crawl where I received most of my cuts and scrapes since it was quite rocky. She also took a bunch through the entry arch that doubled as an obstacle. He carries a big hose and yes its water is ice cold. A monkey for everyone to see as they entered the race area under this archway. One final dip before jumping over fire. Yes, there were flames. I wanted to stop and tell them to stoke them up a bit. The barbed wire crawl with its rocks wreaked havoc on my knees and elbows. 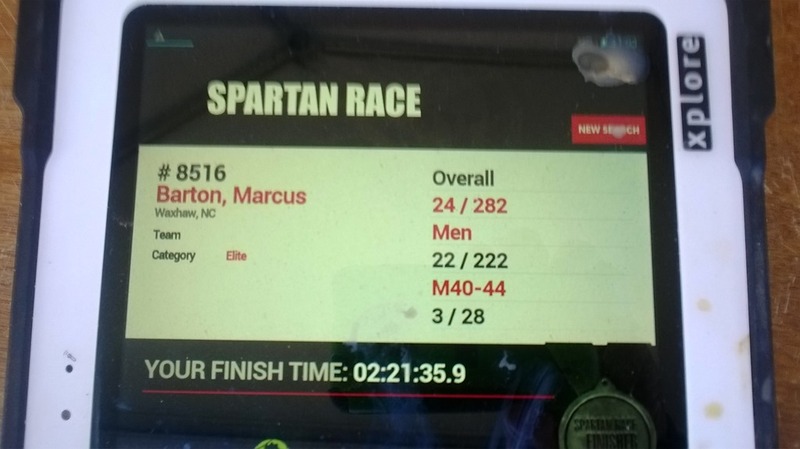 I finished 24th overall and 3rd in my age group. Many, many folks have asked me if I am going to do more. I’d like to, as I think it was a blast to race. 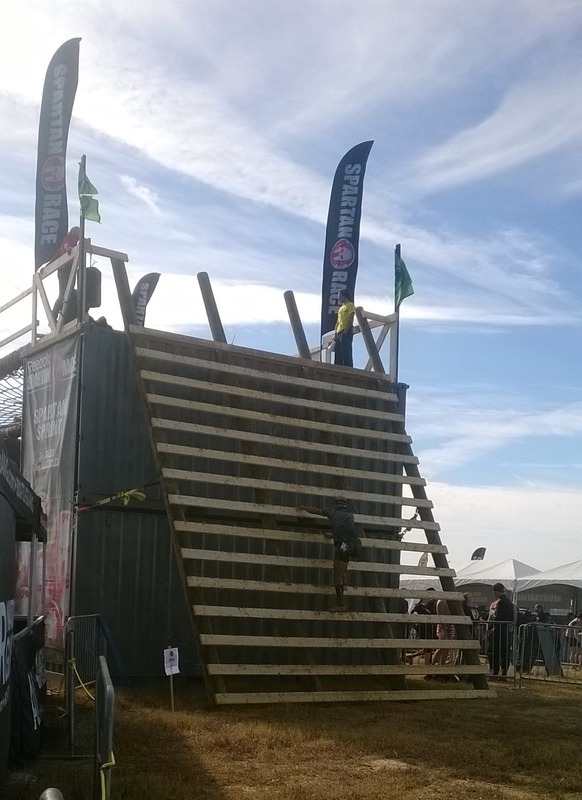 I think I could do a little better if I would base my training around obstacle racing. 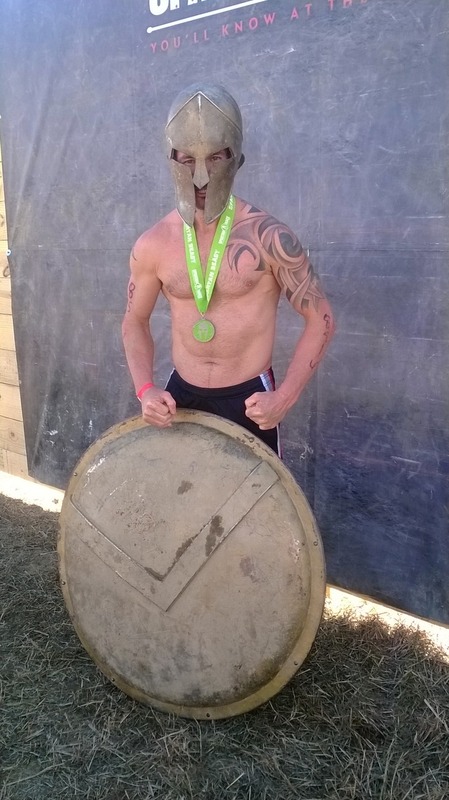 However, I think the nature of offroad triathlons and obstacle course racing differs quite a bit. If you’re going to do both, you’d have to figure out which one is priority as you wouldn’t be able to properly train to be good at both. But for now, it will have to take a back seat since XTERRA is still my primary sport and my true love. Products used: GU Roctane and GU Brew. Damn Marcus this is CRAZY!!! Congrats and tell Alba we said HEY!